Bangkok University Gallery is delighted to invite you to BRANDNEW Art Project 2015 which has been organized for tenth consecutive year. Since the initiation, the project has been supported by both governmental and private sectors and many contemporary art galleries with the cooperation of art teachers and students from many universities which are Bangkok University, Silpakorn University, Chulalongkorn University, King Mongkut’s Institute of Technology Ladkrabang, Burapha University, Srinakharinwirot University, Chiang Mai University, Khon Kaen University and Mahasarakham University. 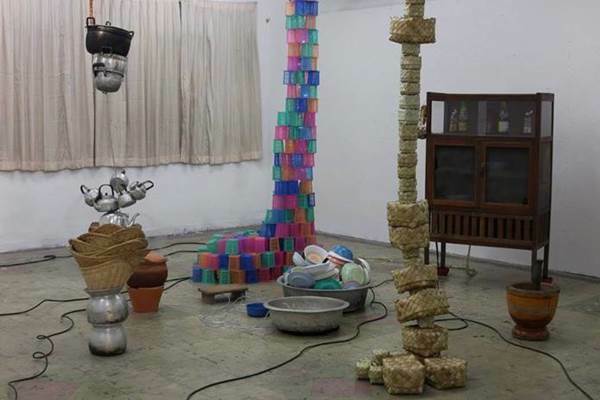 For the exhibition at WTF, we'll exhibit the work by Rodwiroon Wannakaew – install movable and audio medium with electronics appliance and Thai local kitchen utensils to depict Thai’s way of living and belief.